The Most Beautiful Girl in Nigeria (MBGN) was crowned a few days ago and the winner became Miss Anita Ukah. We are here to talk about the lucky queen's biography, state of origin, age, relationship, net worth, lifestyle and every other information we could get about her. 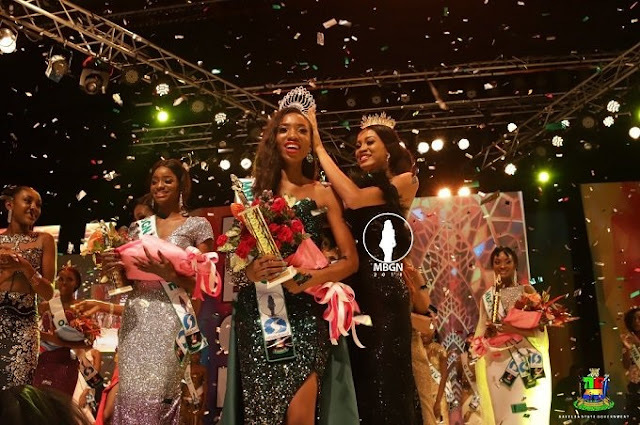 The Miss Imo, Queen Anita Ukah emerged the winner at the Most Beautiful Girl in Nigeria pageant, 2018. The competition was held on the 21st of September, 2018 at the Prestigious Gabriel Okara Cultural Center Yenogoa, Bayelsa State and it was a huge success. With so many people wanting to know more about the lucky lady, we are here to share them. Let's keep moving! Anita Ukah, the new Most Beautiful Girl in Nigeria was born on the 14th of August, 1995 and she is from Imo State. She had her early education in Imo State and graduated from the Igbinedion University, Okada, Edo State with a degree in Laboratory Science. She is tall so to say, with an amazing height of 6ft 2in. Before the MBGN 2018, she had already won a crown for herself. She had been active in the pageantry industry for a while now and in 2014, was the winner of the title, Miss Igbinedion University, Okada (IUO). Aside beign a beauty queen, Anita is a laboratory scientist and is fervent about public health. She is also an advocate for the INEC’s Permanent Voters Card #PVC and you will always hear her asking people to enroll. She also has a fashion line called The Uzo Brand. Maybe Anita is one of the celebrities who chose to keep their relationship lives outside the social media and cyber world, as we haven't been able to get much verified information about her boyfriend and relationship life. Maybe that's all we know about her for now, we will include more info as we come across them. Kindly remember to use the share buttons below to pass this across to your friends and also check out Davido's profile, his net worth will shock you!